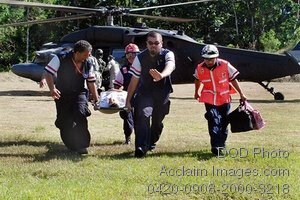 Description: Free, public domain image: Costa Rican Red Cross Members Carrying an Earthquake Victim . Members of the Costa Rican Red Cross transport a 65-year-old female earthquake victim here from a Joint Task Force-Bravo helicopter to a waiting ambulance Jan. 10 in San Miguel, Costa Rica. Four JTF-Bravo helicopters and 34 American servicemembers deployed from Soto Cano Air Base, Honduras, at the request of the Costa Rican government to provide lifesaving support to those affected by the earthquake. (U.S. Air Force photo/1st Lt. Candace Park.